The Canarias InfraRed Camera Experiment (CIRCE) is a near-infrared camera operating in the 1-2.5 micron wavelength range, designed and constructed by the University of Florida, to be used as a visitor instrument at GTC. At present CIRCE is limited to near-IR broad-band imaging (JHKs standard filters) in a total field of view of 3.4 x 3.4 arcmin with plate scale of 0.1"/pix, and polarimetry over a 11 x 11 arcsec field of view. Future development might allow CIRCE to work as a low resolution spectrograph. CIRCE is meant to fill the gap of infrared instrumentation on the GTC while the second-generation instrument EMIR is being prepared. Even with the presence of EMIR, however, CIRCE has characteristics that complement those of EMIR so that the instrument is expected to remain competitive for a long time. Being a visitor instruments, this web page gives a minimum amount of informations. Users are invited to visit the full CIRCE web site maintained by the University of Florida. 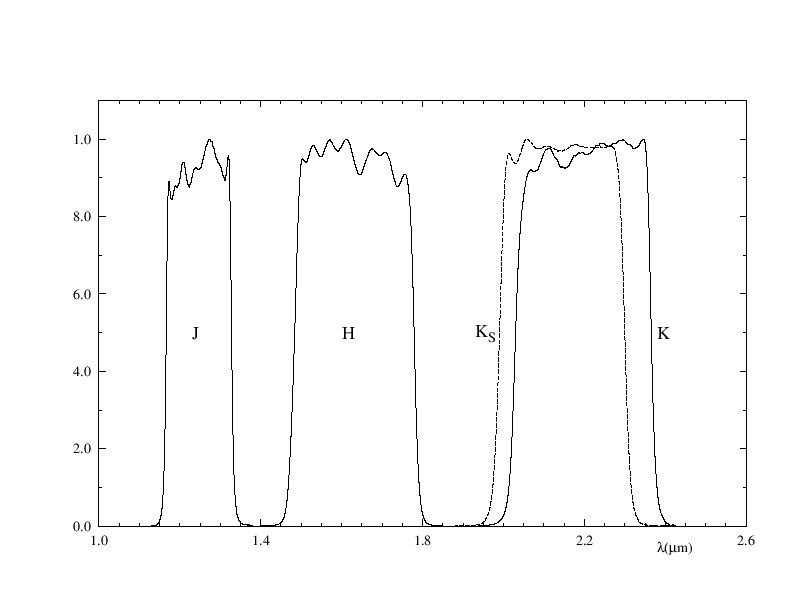 CIRCE operates on the three classical near-infrared bands J, H, and Ks, centered at 1.25, 1.62, 2.12 microns, respectively. The detector is a 2048 x 2048 pixels engineering grade HAWAII-2RG optimized to work on the 1-2.5 micron wavelengths range. The detector covers a 3.4' x 3.4' field of view with plate scale of 0.1"/pix. The detector is subdivided into 32 indipendent channels for quick readout. Note that 2 channels are inactive, so that some care should be taken in order not to place sensible targets at this position. The minimum exposure time for a full frame image is 3 seconds. Typical readout noise is 30-45 e- RMS, channel dependents. Also, due to the high sky background in the NIR, the maximum recommended exposure time in each band is as follows: Ks - 25s; H - 45s; J - 60s . Substantially shorter exposure times are generally needed to allow dithering on timescales sufficient to properly subtract the rapidly-varying NIR sky background. CIRCE image quality is essentially always seeing-limited at the GTC. 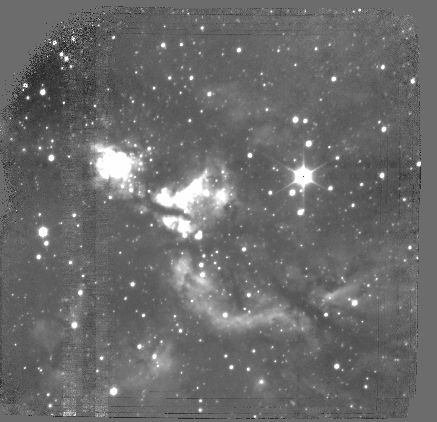 Image quality as good as ~0.3-arcsec FWHM have been obtained, with typical seeing around ~0.6-0.7-arcsec FWHM. Overall instrument efficiency is rather good. The following table gives the 5-sigma limiting magnitude (Vega system) for a point source in 0.6-arcsec FWHM seeing (typical for the GTC in the NIR), assuming a 3600s on-source exposure time and an airmass of 1.2. Also, the complete table with the CIRCE zeropoints values (Vega system) can be found here, including the night conditions, for the full dataset of CIRCE observations. 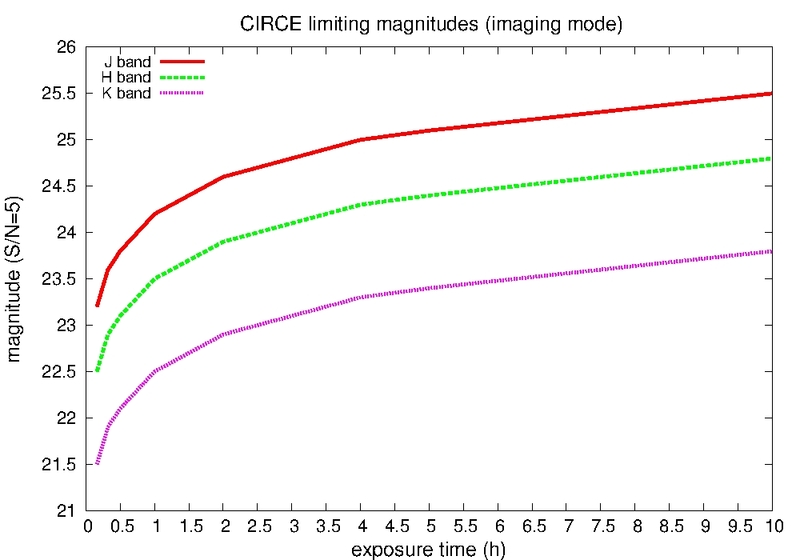 For exposure time estimates, the following plot shows the limiting magnitudes with CIRCE for getting S/N=5 as a function of the exposure time, for a point source in 0.6-arcsec FWHM seeing. Limiting magnitudes achievable in CIRCE as a function of time. In order to compute the correct exposure times for your observations, a basic exposure time calculator is available. Position of the three classical bands JHKs (K band is also shown). CIRCE's fast photometry is offered as a "guest mode" for the instrument. In order to apply for fast photometry observations with CIRCE, observers must do so through collaboration with the CIRCE science team at the University of Florida, which must be arranged before submitting an observing proposal. The CIRCE team will assist the proposer in developing the experimental design, including readout modes, time sampling, dither strategies, field of view, etc. Since this will likely have a strong impact on the proposal itself, we recommend establshing contact at least 2 weeks before the proposal deadline. The CIRCE HAWAII-2RG detector has 32 amplifiers, each of which reads out a 2048x64-pixel strip of the detector. These are clocked in parallel, and the base clock speed is 100 kHz (100,000 pixels per second per amplifier). This enables a fast photometry mode where a "band" of pixels 2048 pixels wide can be read out in 64*10 microsecond = 0.64-milliseconds. Thus, for a sampling time that is N*0.64 milliseconds, the effective field of view is 200-arcsec wide by N/10 arcsec high. Both up-the-ramp and CDS readout modes are possible, with differing duty cycles, reset impacts, and saturation issues. For details, contact the CIRCE PI Stephen Eikenberry (eiken at ufl dot edu). Unlike standard dual-beam polarimeters, CIRCE uses a wedged double Wollaston prism to allow measurement of the linear Stokes parameters in a single image covering a 11 x 11 arcsec area. This design is the main strength of CIRCE polarimetry mode since fast polarimetric variablility of interesting astrophysical sources can be investigated with simultaneos measurement of the q and u parameters. In addition, only two half wave plate rotations can be used instead of all four significantly reducing the observing time. 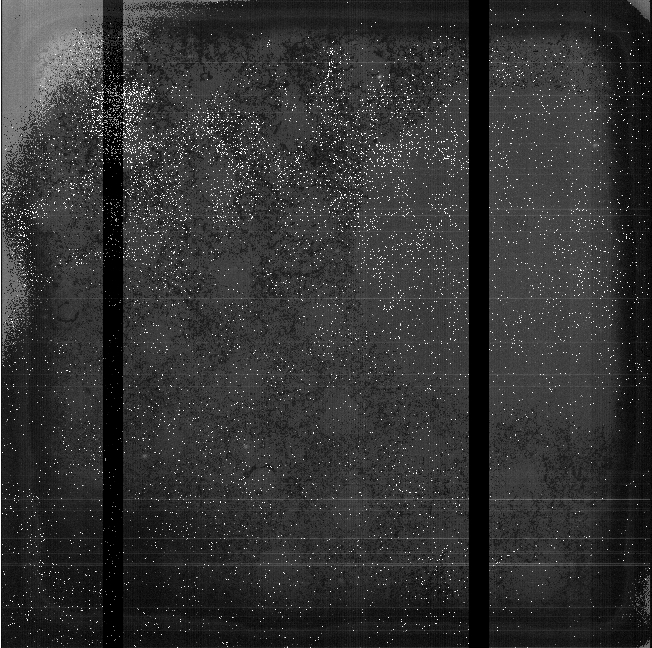 The linear arrangement of the four images permits reading only a narrow stripe of the detector, allowing integration time as short as 100 milliseconds to be used for science observations. At present, only the (0,45) degrees rotation of the half-wave plate of CIRCE is offered for science, which is sufficient to fully define the polarization state of a source. Polarimetry mode acquisition image, showing the four images created by the double wedged Wollaston prism. The field of view is 11 x 11 arcsec. 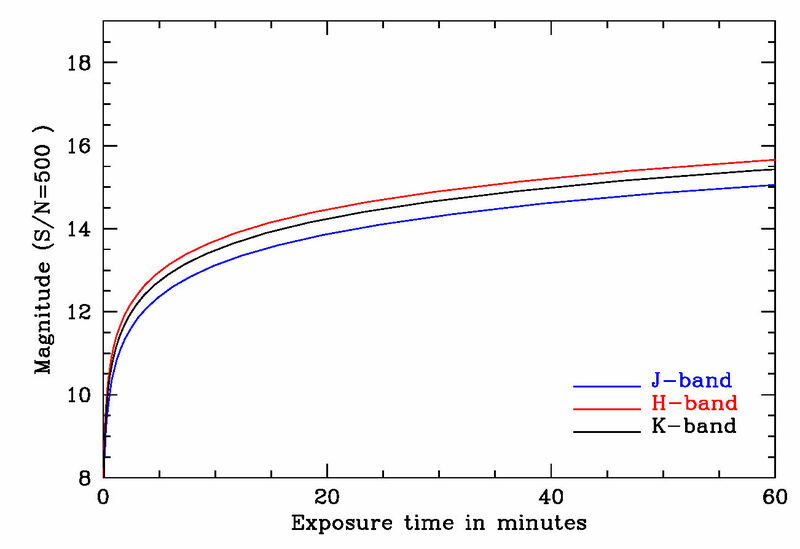 The high S/N necessary for good polarimetric measurements implies long exposures times, with mag~16 beeing an effective limit in all bands (see figure below). When observing faint target (> 12 mag for all filters), the single dither position should be of at least 20 seconds, but not more than 35-40 s due to sky variability (up tp 60 s for J band) in order to ensure an effective use of the telescope time is made (duty cycle > 50%). The configuration of the detector can be set to 6 ramps each with 5 s of exposure time (or 6 ramps each with 10 s exposure time in J band where the sky is more stable). These configurations provide a total exposure time of about 5 minutes when a five-point dithering pattern is used (note that in polarimetric observations it's strongly suggested to use a five-point or a three-point dither on a line as the default dithering configuration). For bright target observations (mag < 9 for Ks and H, mag < 8 for J) the only option is to set the exptime as short as possible (100 ms), and 100 ramps or more (due to the readout time this will require about 20 s to complete). Next table summarizes the different configurations recommended in CIRCE polarimetric mode according to the magnitude of the targets. 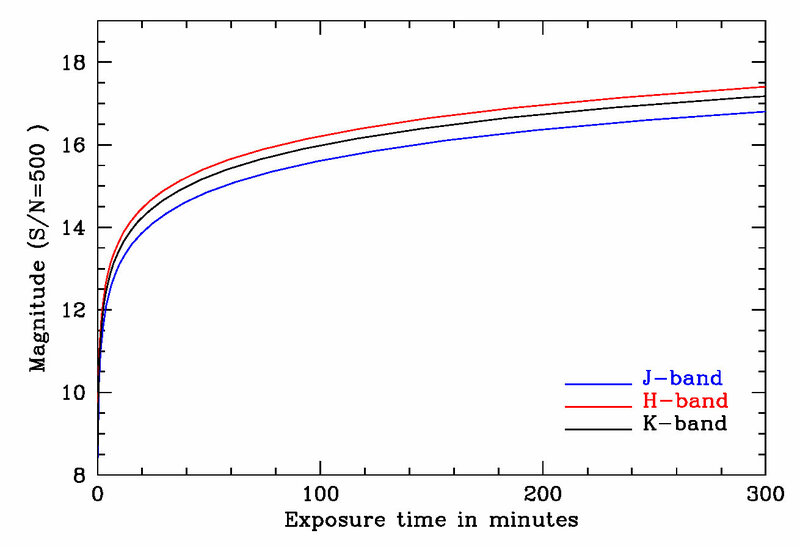 On source exposure time in minutes needed to reach a given magnitude with S/N=500. The lower panel shows a zoomed view of the upper panel for exposure times lower than 1 h.
For calibration, a polarized standard should be observed before and after the science observations with all filters of interest. A suitable list of polarized standards from Whittet et al, 1992 ApJ, 386 can be found here. The lack of dim polarized/null standards is known to be a problem for imaging polarimetry with large telescopes, but CIRCE can offer observations of point sources as brigth as 7th magnitude in Ks and H filters, or about 5th magnitude in J filter, even under excellent seeing conditions (about 0.5 arcsecond). Observations of brighter targets than these limits are still an option but should be discussed with UF CIRCE team. As an example, targets observed during commissioning are given in the table below. It is warmly advised to contact, or start a collaboration with, the UF CIRCE team in order to have more information on how to use CIRCE in this observing mode, or read the detailed description about CIRCE polarimetry, together with discussion of instrument polarization and observing strategy, presented here. CIRCE has an all-reflective optical system, consisting of 8 diamond-turned aluminum mirrors. Light enters the CIRCE cryo/vacuum space via an Infrasil entrance window. 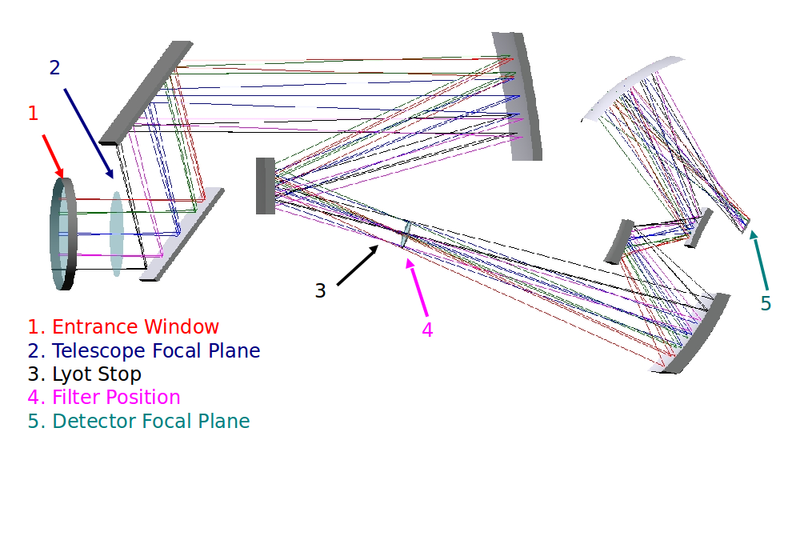 A linear slide at the telescope focal plane positions the Half-Wave Plate (HWP) and polarimetry/spectroscopy mask in/out of the beam. Two fold mirrors direct light into a 2-mirror collimator system which produces an image of the GTC secondary at the pupil location. In this region, CIRCE has selectable filters, a selectable Lyot mask for reduced background, and a selectable grism/prism wheel. The light then passes to the 4-mirror camera system. These are 16th-order polynomial aspheres, optimized to minimize the aberrations over the CIRCE field of view on the GTC. The camera focuses the light on a HAWAII-2RG 2048x2048-pixel detector array from Teledyne Imaging Systems. Top: Optical layout of CIRCE. Bottom: Drawing of CIRCE optical bench. Near-IR observations combined with the relatively poor cosmetic of the detector dictate the use of dithering for all science observations. For this reason the phase 2 tool has a number of built in dithering patterns among which one can select the most appropriate for its science. A full description of these patterns is given in the GTC Phase2 manual. Also, a bad pixels mask can be downloaded from here to be used for removing some of the cosmetics during the reduction process. Full frame raw CIRCE image showing the cosmetic of the detector (left). The two narrow vertical bands correspond to the two non-functional channels. Note that virtually all defects can be eliminated with a proper dithering as it's shown in the example image courtesy of Dr. Román-Zuñiga (right). Based on CIRCE commissioning observations, we recommend dwell times of ~30s in Ks-band, and < 45s in H-band and J-band. To avoid saturation (from sky and/or targets), these may be divided into multiple images taken at the same dwell location. Dither "nodding" amplitudes should be sufficient to cleanly separate target images. For low surface-density stellar fields, nod amplitudes of ~10-arcsec should be sufficient. For extended objects, the nod amplitude should be greater than the maximum size of the object. If the object size is sufficently large (i.e. > 1-arcminute diameter), we recommend that the observer use off-source skies to obtain proper sky backgrounds. CIRCE internal overheads are really low. For typical deep exposures, open-shutter efficiency is about 70% (including dithering, readout overheads, etc.). This value is quite good for NIR imaging, and makes the operation of CIRCE instrument really efficient at the telescope. CIRCE data are stored as multi-extentions fits files. The number of extensions and their content depends on the readout mode of the instrument which in turn depends on the selected filter, the exposure time, and the observing strategy. A full description of what file format you should expect as result of your observations can be found here. In short, when the requested exposure time is less than 12 seconds, the detector is first cleared and then readout twice in Correlated Double Sampling (CDS) mode. First read (Rd1) occurs at the start and second read (Rd2) at the end of the exposure. The corresponding FITS file will have 3 extensions, containing the first readout (Rd1), the second (Rd2), and the difference Rd2-Rd1, in this order. The third extension is therefore the science signal. For exposure times between 12 and 20 seconds, after clearing the detector is read out twice at the start and twice at the end of the exposure (Fowler sampling with 2 reads). The corresponding FITS file will contain 4 extentions: Rd1, Rd2, Rd3, Rd4, respectively. The science signal is retrieved as: (Rd4+Rd3-Rd2-Rd1)/2. For exposure times between 20 and 40 seconds, there are four readouts before and four readouts after the exposure, so the image is then calculated as (Rd8+Rd7+Rd6+Rd5-Rd4-Rd3-Rd2-Rd1)/4. For exposure time above 40 seconds there are eight readouts each before and after exposing. Note that when using the H filter or the Ks filter, the detector is always readout only twice (CDS mode) irrespectively of the exptime, so the rules explained above only apply when the J filter or a narrow band filter is used. According to the adopted dithering pattern selected during Phase 2, a user defined number N of images can be taken one after the other without moving the telescope. In this case to reduce overheads these N images will be written as a single FITS file containing as many extensions as there are readouts, that is N*2 for CDS readout mode (not N*3 because in this case the third extentions is not included), N*4 for Fowler2 sampling, N*8 in case of four readouts, and N*16 in case of 8 readouts. Note that the rules how to calculate the final image from the individual readouts apply only to the first exposure. in case more exposures are obtained (i.e. N>1), the other exposures are calculated the same way but with the corresponding higher extension numbers. 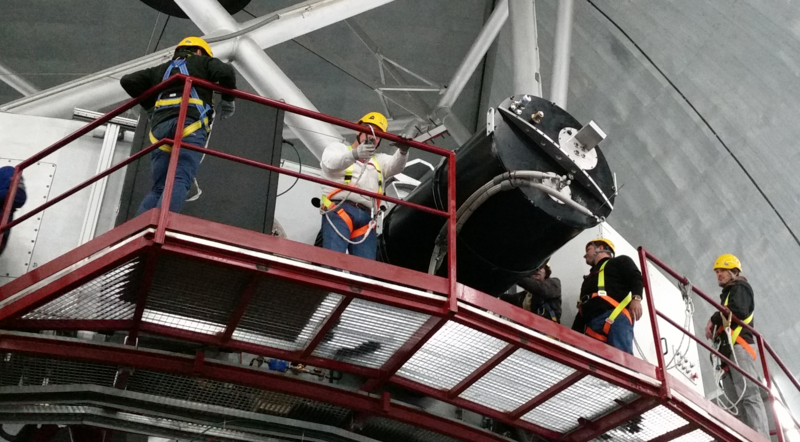 CIRCE being installed in one of the GTC folded Cassegrain focus in Dec 2014. CIRCE data reduction is easiest using the SuperFATBOY data reduction pipeline. SuperFATBOY is an XML-controlled GPU-enabled Python pipeline developed and supported by the University of Florida. More details can be found at the SuperFATBOY Web Page (user: fatboy / password: gators). For astrometric calibration of CIRCE data, Gaia DR1 catalogue provides rms accuracies better than 0.1 arcsec. Gaia DR1 catalogue is available through Vizier service here. and will include a citation to the CIRCE reference publication: Eikenberry et al. (2017) (arXiv:1709.05542). (*) 1 hour of observing time for a TOO follow up triggered by LIGO, or a gamma-ray burst trigger.